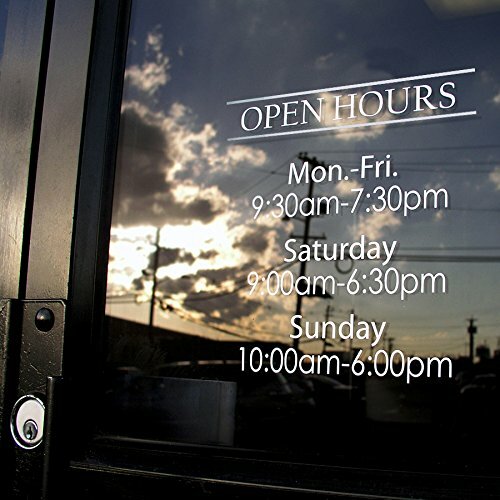 This is a business hour window decal on 10.5"x13.5" . Good for business open hours or simple signage for your business. There are two ways to produce your order. We can prepare your sign for outside of window installation or inside. If you choose inside, you'll get a reversed image. You'll have an option to tell us at the very end of editing sign. It comes with a free squeegee and easy install manual. This is a business hour window decal on 10.5"x13.5" . We can prepare your sign for outside of window installation or inside. If you choose inside, you'll get a reversed image. If you have any questions about this product by impactonlineprinting, contact us by completing and submitting the form below. If you are looking for a specif part number, please include it with your message.